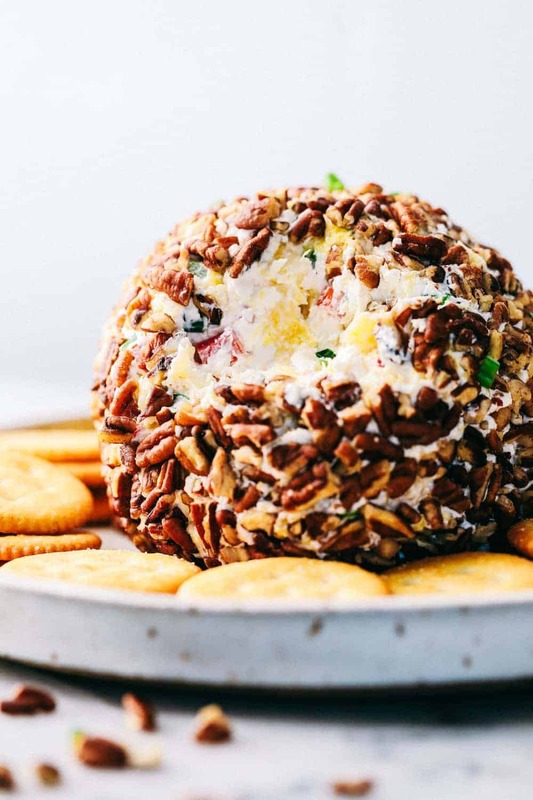 Pineapple Cheese Ball is the next best twist on a favorite classic. With Different textures and flavors it will be the hit at your next gathering! 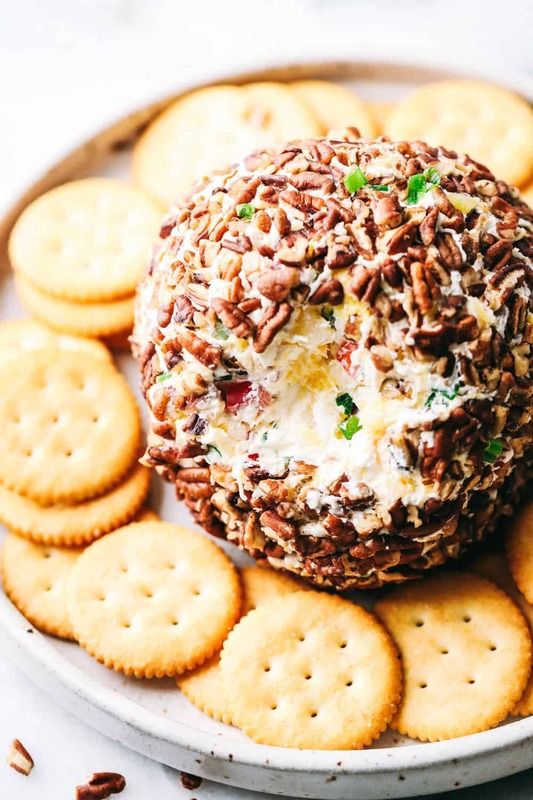 A good cheese ball is always a favorite at our house. You also need to try this Bacon Ranch Cheese Ball, Jalapeño Bacon Cheese Ball, or this sweet Canolli Cheese Ball! We had a good friend a few years back that told us about his mom’s famous cheese ball. He said that I had to make it as soon as possible and that it is always a favorite when they get together. Pineapple cheese ball sounded really unique to me and I had to try it out as soon as he gave me the recipe. He was right! It was incredible and we couldn’t seem to get enough. The flavors blended so well together and I actually loved the sweet pineapple throughout. 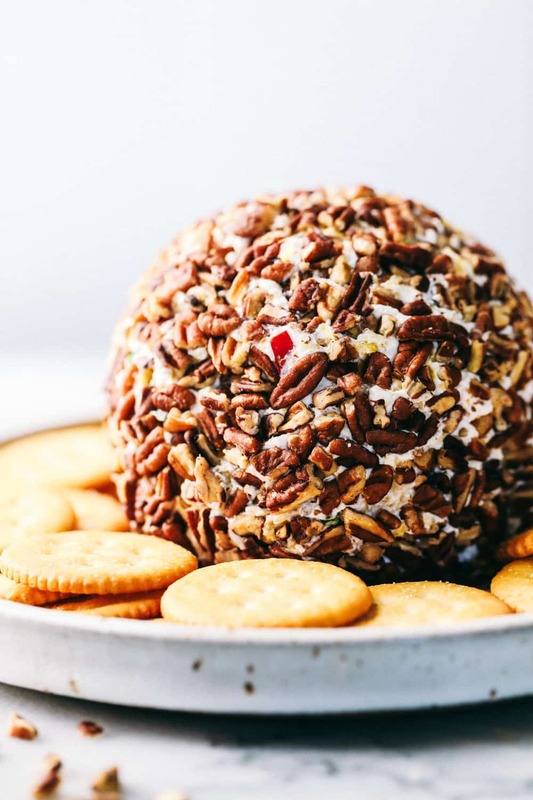 The crunchy pecans on the outside always give a cheese ball the perfect finishing touch. I take this cheese ball with me to every gathering that we have, especially around the holidays. This is a favorite now at our house and I know it will be a hit at yours as well! What are the ingredients of a Pineapple Cheeseball? 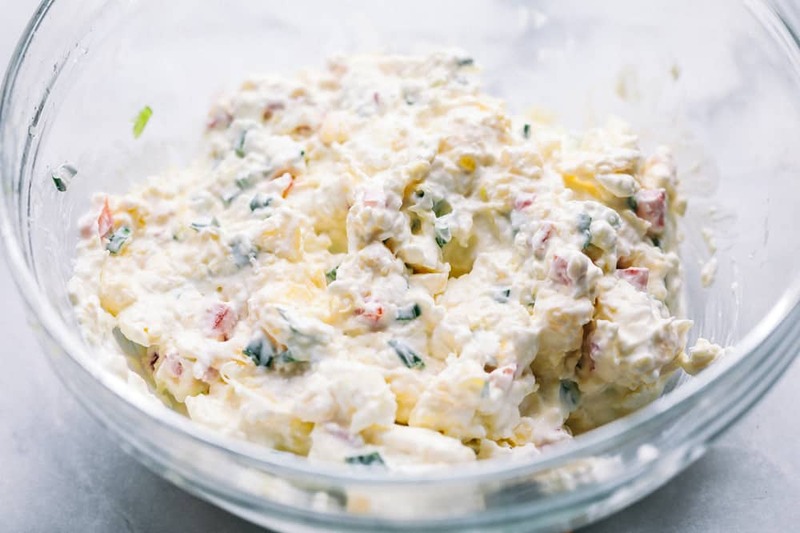 First: Add the Cream Cheese, drained Crushed Pineapple, chopped Bell Pepper, Green Onion, and seasoning salt to a medium sized mixing bowl. Mix all the contents together. Second: Form into a Ball, and Transfer to serving plate. Third: Roll in chopped pecans. Serve with crackers. How long should cream cheese be left out to soften? When letting your cream cheese soften, leave it on the counter for half an hour in its original container. After 30 minutes, open the package and check the texture. If the cream cheese still feels cool to the touch, then check it again in about 20-30 minutes. How long can a cheese ball sit out? Since cheese balls are usually served as appetizers at parties, they shouldn’t be left out for longer than two hours at a time. How to pick a good Bell Pepper? When picking a bell pepper it’s important to first think of whether you’re looking for a more bitter flavor or sweet. Red Bell Peppers are sweeter because they are the most Ripe, with green being the most bitter because it is the least ripe. Another important thing to check when shopping for Bell Peppers is the weight. The heavier they are the more flavor they will have. This will also be shown through the peppers skin. If the pepper’s skin is tight and not wrinkly, it will mean it is juicy and hydrated giving it the most flavor. Beyond that, just make sure the Stem looks healthy and that you don’t notice any bruising upon the pepper. 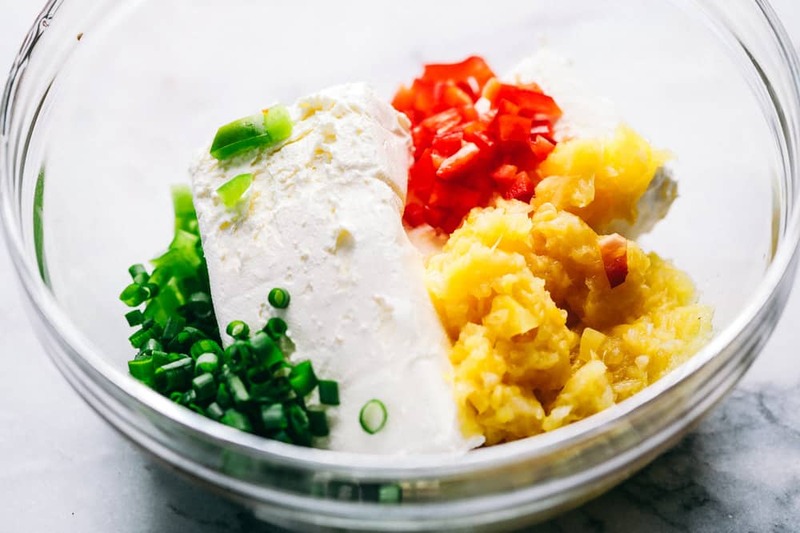 Add the cream cheese, drained crushed pineapple, bell pepper, green onion, and seasoning salt to a medium sized mixing bowl. Mix together. Transfer the mixture to a serving plate and form a ball. Roll in chopped pecans. Serve with crackers. This recipe was passed down from my mom and I have been making it for more than 3 decades. This recipe is fantastic! I’ve made this several times. for the holidays. The blend of flavors are just right and you keep on digging in for more and more. I have been asked for the recipe numerous times. I’ve made this cheese ball for years, and I like it, but I’m not in love with it. Feeling that the flavor needed “something”, I finely chopped up and mixed in a handful of crystallized ginger.. Bingo! The warm sweet bite of the ginger mixed well with the pineapple and sweetened the mixture up a tad. Bacon might also be a good addition to the basic recipe if you want to keep it savory.